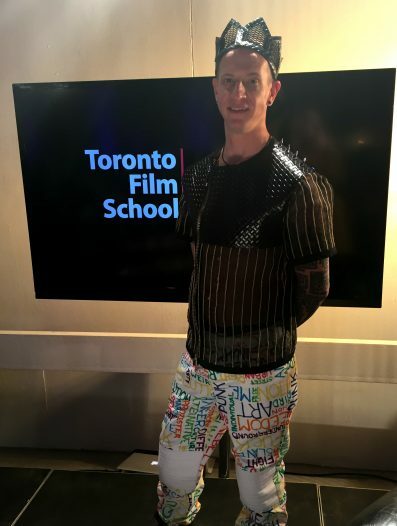 Toronto Men’s Fashion Week (TOM*) is one of the country’s most significant fashion events and this year it also represented an incredible opportunity for a handful of Toronto Film School students and graduates. 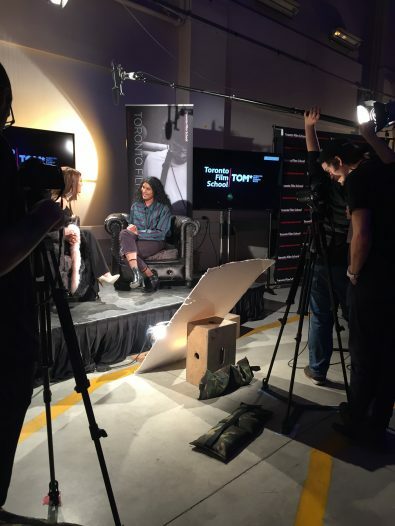 Thanks to a partnership Toronto Film School has with TOM* a number of Marketing for Fashion and Entertainment, Film Production and Fashion Design students were invited backstage to gather exclusive video content and to cover the event on social media. In this article, Toronto Film School students and graduates reflect on their experience at this extraordinary industry event. Before I started this program, if someone had told me that I would be sitting front row at a fashion show and interviewing the designer, I would never have believed them. 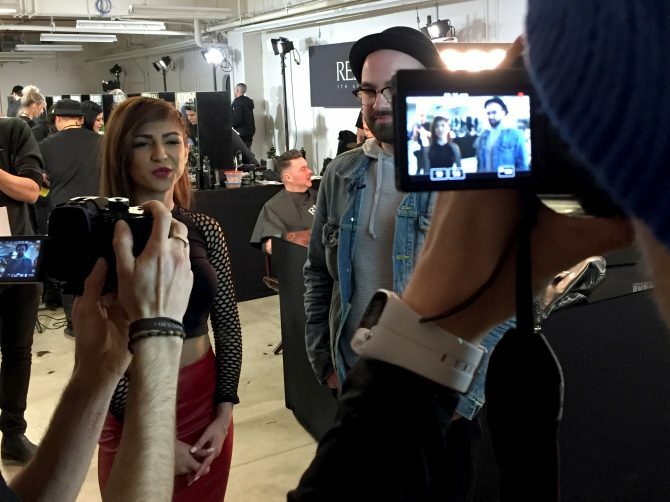 That is precisely what I had the opportunity to do this past weekend at Toronto Men’s Fashion Week. Though I have been studying Fashion Marketing for the last 18 months, I have never taken advantage of the many opportunities the school provides us. When I decided to help with the social media marketing at this years event, I did not anticipate leaving the evening with an entirely new outlook on the fashion industry. Having the chance to see a line being debuted on a runway allowed the chance to see the way textures interact and colours pop under the bright lights. This was so different than seeing clothing online, or even in-store, hanging on a rack. A runway show takes clothing and turns it into performance art, and the energy in the room only works to elevate its impact. This was such an incredible evening, truly one of the highlights of my time at the Toronto Film School. I look forward to my future in the industry, and to more opportunities like this. When I was asked to be the director of photography at this season of TOM*, I gladly said yes. We were able to put together a great crew of talented Toronto Film School students to make sure that we captured the best images possible. Amazing atmosphere, glamorous runway shows, creative designers are just some of the components that make this event one of the most beautiful to capture on camera and be to be a part of. I had the opportunity to attend Toronto Men’s Fashion Week, to support one of my teachers who teaches in the Fashion Design program at Toronto Film School, Ross Mayer. As a graduating student, this was an exhilarating experience since it was my first time attending this show as a guest. At the event I was wearing my very own clothing designed for my upcoming men’s collection. I had an amazing time and received incredibly supportive and positive feedback about my clothing. I was taken aback when the school asked to interview me regarding my collection on camera; this was very first time having an interview with a designer, especially on camera. Nervous as I was to answer questions, I took a breath before I spoke, but overall the experience was fantastic, everyone was so kind, and I never had my photograph taken so many times before. I felt like a star, and it wouldn’t have been possible without the support of the teachers at Toronto Film School and all the knowledge they shared with me over these last 18 months of school. Thank you to everyone who has made such a positive experience at TOM* and at Toronto Film School. 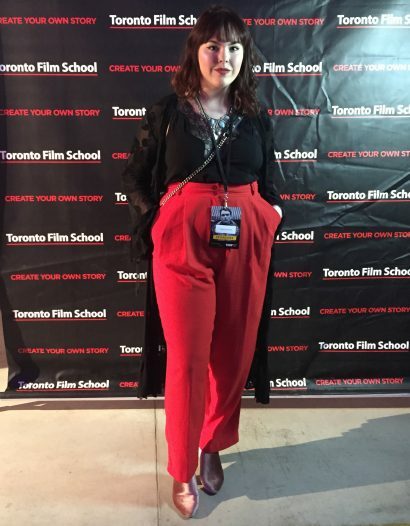 As a graduate of the Marketing for Fashion and Entertainment program, I am always quite humbled when the Toronto Film School considers me to help cover social media at industry events. I could never turn down such a generous opportunity of being apart of something so influential as Toronto Men’s Fashion Week. This marks my second time covering social media at TOM* and every season it becomes bigger and better, showing that Canadian designers can be at the forefront of fashion. The first show of the night, Electric Runway, displayed the impact on wearable technology and its appearance in fashion. Rhowan James confirmed that you could never have too much black in your wardrobe as long as it’s embellished with gold details. Zane Barlas took Toronto back in time to 1920 England with striking tailored suiting and outerwear. Finally, the dup Hip & Bone sent an array of refined basics for the modern man down the runway with an impact on luxury. I attended the TOM* on its opening night. I had the great pleasure of getting invited to such a fantastic event. As a recent graduate, attending this show confirmed my love for this industry and made me want to be a part of it even more. Just having the privilege of sitting in the front row seats of the show made me appreciate the event at its prime and take a closer look at the amazing clothes modelled on the runway. The show itself was phenomenal. The styles were somewhat avant-garde, but wearable in everyday settings. Also, I got to get know so many new well-established designer names in the Canadian fashion scene. It was also great to meet new people, make new connections and meet again people from my school, friends and teachers who were either volunteering or working the event. Not to mention how an inspiring environment it all was, everyone looked beautiful and fashionable, and I couldn’t stop taking pictures. It made me go home with a more convincing attitude towards what I love and wish to do with my career. Overall the experience was unforgettable and worth me going. If I were given the opportunity to go again, I would go in a heartbeat.